Romania’s wartime fascist dictator Ion Antonescu was shot on this date in 1946. 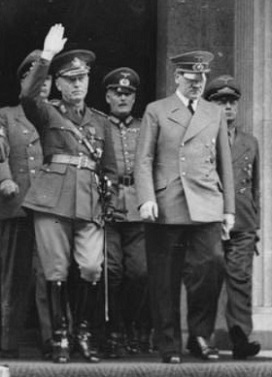 Antonescu (hand raised) and Adolf at Nazi headquarters in June 1941. Behind them are Ribbentrop and Keitel. An army officer who worked his way up to the brass via his exploits in the Second Balkan War and then in World War I, Antonescu emerged as a major nationalist politician in the interwar period. He was the elite political figure who allied with Corneliu Codreanu‘s Iron Guard movement. That left Carol’s son Michael the figurehead of state, and Ion Antonescu the actual strongman — at least, once he tamed the Iron Guard. The Romanian “General Antonescu Army Group” joined the fateful invasion of the Soviet Union. Romanian divisions were prominent at Stalingrad where some 150,000 were lost as casualties or prisoners. … pick one of three. Provided it’s the last one. As the Red Army approached from the northeast and American bombers struck from Italy and North Africa, Antonescu scrambled to sound out what kind of a deal he could cut with the Allies. Antonescu might perhaps have negotiated without the desperation due his position,† and dilated with his decreasingly patient enemies while the Germans flattered him with the dream that he could still retain conquered Bessarabia (present-day Moldova). Only with the Soviet army on his doorstep was Antonescu finally disabused of the statesman’s dream and office both — when King Michael ousted Antonescu and immediately switched Romania to the Allied side.‡ This move accepted the Soviet occupation that was about to become a fait accompli, and put Romanian soldiers into the field for the last months of the war fighting against their former German allies. It also put Antonescu into Soviet custody. He rode out the war under guard in Moscow, then was shipped back to postwar Romania where he would serve as the feature attraction of the People’s Tribunals. One hundred eighty-seven people answered war crimes charges to these bodies; there were 13 death sentences, but only four were actually executed.§ All four — Transnistria governor Gheorghe Alexianu, Interior Minister Constantin Vasiliu, and Foreign Minister Mihai Antonescu (no relation — were shot on this date at Jilava. The executions were filmed. * Carol went into exile, never to see his native soil again. He died in Portugal in 1953. 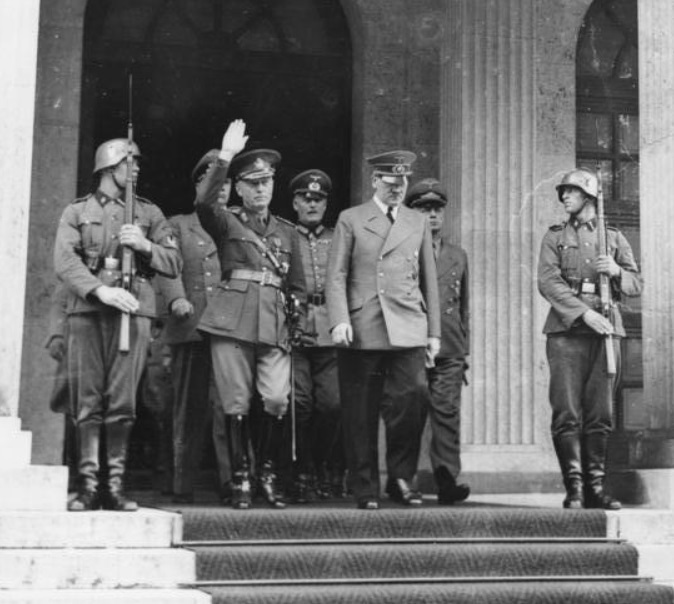 † Berlin was keeping an eye on Romania’s separate-peace feelers, too, and had prepared a plan to occupy Romania should it attempt to desert the Axis. This is precisely the fate that befell Nazi-allied Hungary … but in Romania’s case, Germany never had the moment to implement the plan. ‡ Michael was, like his father, forced into exile in 1947; he did not return to Romania until after the collapse of Communism. Now in his nineties, King Michael is still alive as of this posting and remains the claimant should Romania ever re-establish its monarchy.